Background: MicroRNAs (miRNAs) are groups of small non-protein-coding endogenous single stranded RNAs with approximately 18-24 nucleotides in length. High evolutionary sequence conservation of miRNAs among plant species and availability of powerful computational tools allow identification of new orthologs and paralogs. Methods: New conserved miRNAs in P. patens were found by EST-based homology search approaches. All candidates were screened according to a series of miRNA filtering criteria. Unigene, DFCI Gene Index (PpspGI) databases and psRNATarget algorithm were applied to identify target transcripts using P. patens putative conserved miRNA sequences. Results: Nineteen conserved P. patens miRNAs were identified. The sequences were homologous to known reference plant mature miRNA from 10 miRNA families. They could be folded into the typical miRNA secondary structures. RepeatMasker algorithm demonstrated that ppt-miR2919e and pptmiR1533 had simple sequence repeats in their sequences. Target sites (49 genes) were identified for 7 out of 19 miRNAs. GO and KEGG analysis of targets indicated the involvement of some in important multiple biological and metabolic processes. Conclusion: The majority of the registered miRNAs in databases were predicted by computational approaches while many more have remained unknown. 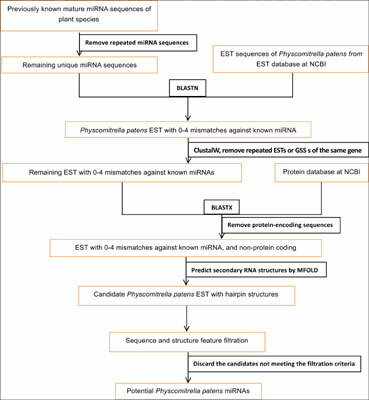 Due to the conserved nature of miRNAs in plant species from closely to distantly related, homology search-based approaches between plants species could lead to the identification of novel miRNAs in other plant species providing baseline information for further search about the biological functions and evolution of miRNAs. Homology search, micro RNA, Physcomitrella patens, RNA silencing, target gene, nucleotides, computational.